I’ve never been very good at makeup, so doing anything more than a cat on Halloween was just pointless. I don’t even have any plans this year but I decided that I wanted to try a little bit harder, because if you don’t try then how are you ever supposed to improve? Myself and Melissa decided to do a devil/angel collaboration, and we were actually supposed to be together at the time of doing them and we were going to get a cute wee photo together but that just didn’t happen, so you’ll just have to pretend that the separate photos of us side by side is actually us together. I’ll be tackling the angel in this post, which I was quite excited about because I could basically go mad with the glitter. I started off using The Ordinary serum foundation and the Seventeen Stay Time concealer for my base, which was quite light coverage that I don’t normally like but I was going for a bit of a softer look with this anyway. The little eyeliner pencil you can see is the Sport FX black and brown eyeliner, I put the brown all across my lid and kinda smeared it in with my finger to make a base for a smokier eye, and also did a little bit of that in my brow to give it some more shape but not fully filled in like they normally are. Then I took Cyprus Umber from the ABH palette, which is just a dark brown, and blended that in until I was satisfied with it. Then I used Primavera, which is the gold, and put that nearer the inner corners of my eye and popped some mascara on. I also put some gold through my brows and on my brow bone and, weirdly enough, on my lips. I then intensified this with a Mac loose gold glitter. In terms of highlight, I went a little crazy. I used the Topshop pink highlighter that I absolutely love and basically went crazy with it, I put it everywhere, including a bit on my collarbones which I ended up not even getting in photographs but it was really pretty, trust me. It doesn’t pick up very well on camera but it’s beautiful. I then decided, you know what, I’m gonna put some more glitter on. So I just dipped my brush right in and went off on one around my cheeks. I know there are chunks of glitter that don’t look the nicest there, but I tried and I loved being super duper glittery for once. I also put some of the gold glitter on my lips, because I saw a really cool photo on Pinterest where the girl had gold glitter lips and I loved it, so that’s where I got some of my inspiration from. I’ve never done a look like this, I never really reach for anything other than the black eyeliner when doing Halloween stuff, so this was a LOT of fun and wiping off the glitter actually made me pretty sad. You can find Melissa’s corresponding devil makeup look HERE. 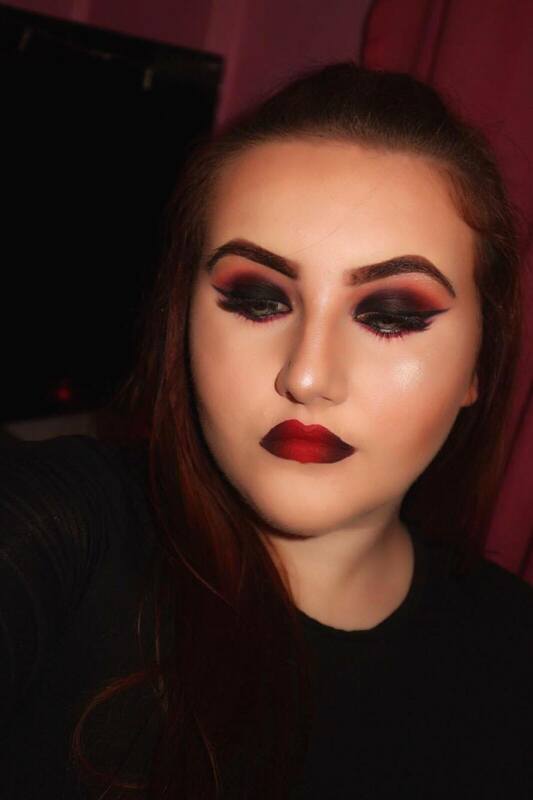 What’s your favourite Halloween makeup look?